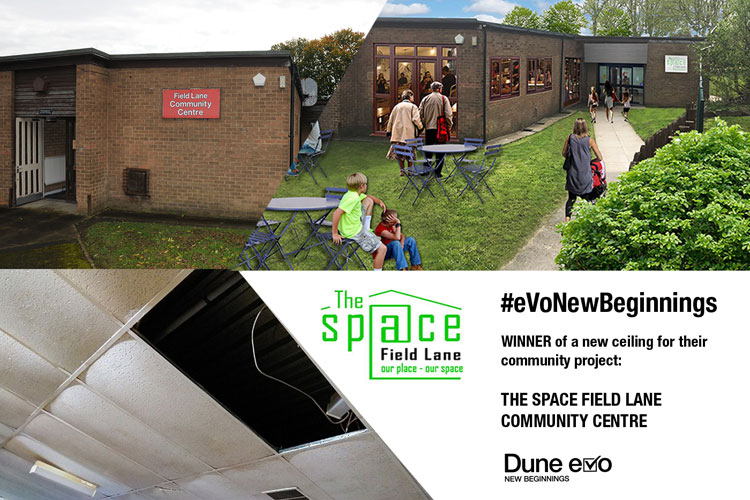 Some two months after launching its #eVoNewBeginnings competition to donate a new ceiling to a voluntary or charitable organisation, Armstrong Ceilings is helping residents of one West Yorkshire town to scratch a seven-year itch. 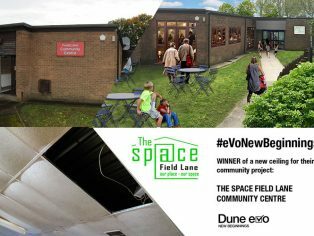 For the winner of its competition is The Space Field Lane – a £480,000 project to renovate a former community centre on the Field Lane estate in Rastrick that has lain empty for seven years. Choosing a winner from all the entries however was a painstaking task, literally, for the three judges – Sara Rees, head of fundraising at the Rays of Sunshine Children’s Charity, Armstrong’s chosen charity for 2018, Graham Taylor, Armstrong’s sales director, and Sara Carter, Armstrong’s HR director. The Space Field Lane project was entered by its architect Neil Hardacre of Pickles Architecture in Brighouse. A group of community volunteers has been working together for several years to bring about a ‘new beginning’ to the former community centre at the heart of the Field Lane Estate in Rastrick in West Yorkshire. It has been closed for seven years and the estate is desperately short of a facility where its community can come together. The project aims to bring about activities for all generations, opportunities for socialising at the planned community café, and training and vital opportunities for the young people of the estate. The estimated cost for removal and replacement of the existing ceiling alone was £16,000 including VAT and fees so winning the Dune eVo ceiling would enable the group to add major value to other parts of the refurbishment, bringing back some of the other key enhancements they have had to forfeit. In their entry trustee Mary Green said: “We have achieved so much already and are just ordinary people determined to make this happen. We have brought the building into our own hands, held consultation days and events, raised over £300,000 in grants and worked with a local project team to pull together the refurbishment plans. “Winning this competition would not only provide us with precious practical and financial help but would be such a morale boost. To have encouragement and support from a business such as Armstrong Ceiling Solutions would be absolutely invaluable. On hearing that they had won the competition, and the new Dune eVo ceiling, an ecstatic Mary added: “We are absolutely delighted. This is terrific news and a real morale booster to us as a team apart from the practical help that the prize will give to our project. The other entries were Pilsley Church of England Primary School in Derbyshire, the 5th Boston Scout Group in Lincolnshire, Sunderland Mind, St Augustine’s Catholic Primary School in Gateshead, People Without Labels which occupies the oldest building in the East End of Glasgow, 1st Winlaton Scout Group in Blaydon-on-Tyne, Kingsmead school in Staffordshire, and Tiber Football Centre in Liverpool. Rays of Sunshine’s Sara Rees said she was honoured to be asked to join the judges’ panel for what was an “excellent” initiative. She added: “We were really impressed with the quality of the applications, so the judging process required some significant consideration and deliberation. The panel discussed each case in turn, assessing them against several measures including the context of the new ceiling, the impact on the local community, and the long-term legacy of the project.